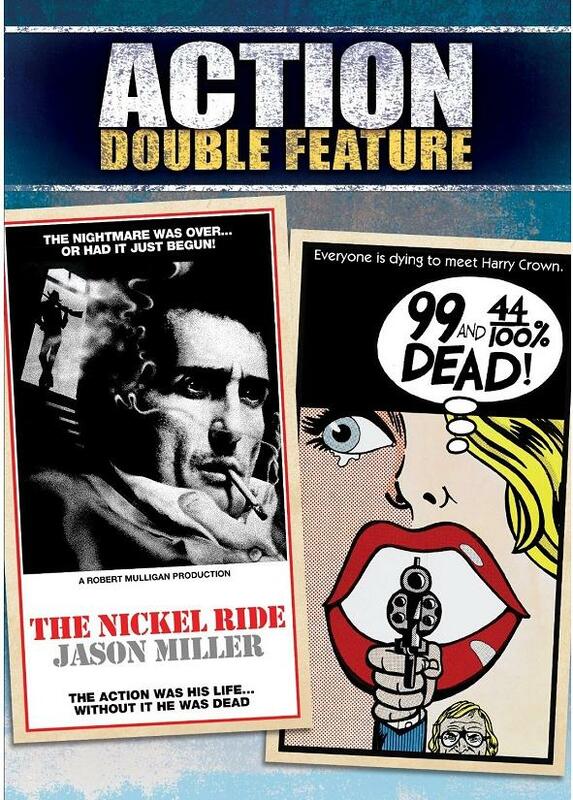 Digi-Schlock: THE NICKEL RIDE/99 AND 44/100% DEAD (Shout! Factory 2-DVD Set) – Schlockmania! If you’re a cult movie buff, the most rewarding part of Shout! Factory’s line of 20th Century Fox catalog title reissue series is the handful of obscurities. Amongst the reissues of familiar titles like Bad Dreams or Race With The Devil, there have a been few titles that have never seen the light of digital video before in this country. Two such titles just got a deserving reissue in the form of The Nickel Ride and 99 And 44/100% Dead – and the results are both impressive and cost effective. Both titles have been hard to hunt down in the past and frequently subject to cropped transfers when they have turned up (an old VHS release of 99 And 44/100% Dead reduced its Cinemascope visual compositions to incoherency). Thankfully, this two disc set gives each title a fresh, anamorphic transfer that preserves their widescreen image in a proper style. The transfer of The Nickel Ride does well by its shadowy look, offering plenty of detail, and the bursts of pop-art color in 99 And 44/100% Dead register strongly. The original audio mixes are retained for each title and, outside of the occasional stray crackle around reel changes, they sound pretty good. Extras are limited to trailers for each film but given the cheap price of this set, the viewer still makes out with a good deal. The transfers look sharp and the rarity of the titles makes it a worthwhile purchase for 1970’s cult film collectors. To read Schlockmania’s film review of The Nickel Ride, click here. To read Schlockmania’s film review of 99 And 44/100% Dead, click here.